This page provides a high-level overview of the features and capabilities of AppMon Application Monitoring and User Experience Management. Application Monitoring continuously discovers and monitors all processing in your application environment using patented PurePath Technology®. PurePath provides a complete multi-dimensional trace of every transaction in a monitored application, giving comprehensive visibility across mobile apps, web apps, web browsers, web servers, Java, .NET, Node.js, PHP, databases, middleware and mainframe apps. When combined with PureStack Technology®, the complete context of business application performance and end-user impact is visible enabling you to quickly drill-down into any problematic transaction to see code-level details. 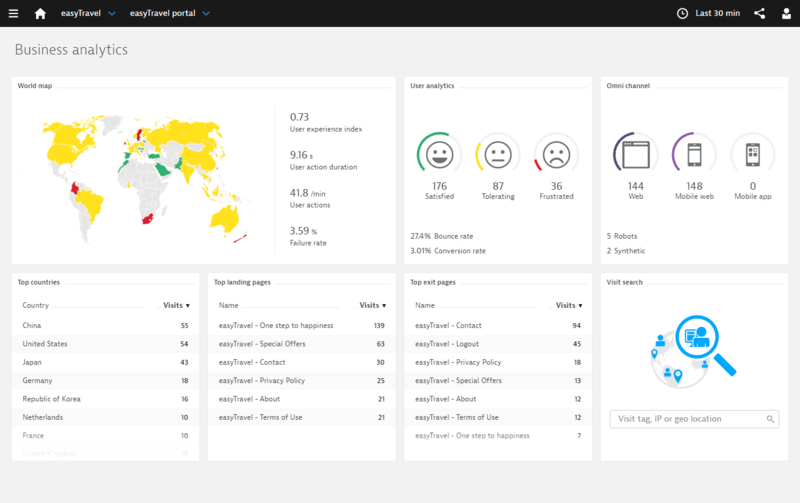 AppMon User Experience Management (UEM) lets you track user behavior on web pages. It helps you identify user problems before your user complains. It also lets you receive business analytics data like the geographic distribution of your web page visitors and average session duration. User actions converted into business contexts such as orders, downloads, views, searches, and more. Usage statistics across browsers, devices, geographies, carriers and connections that let you see every page visited, every click made, individually or in aggregate, and whether performance issues are detected. Slow performance data on site-usage or revenue flow, minute-by-minute, real-time, in production. User’s click-path and along this path they tend to leave. User stratification metrics based on response times and any functional problems along their execution path. In addition, UEM data correlates with server-side performance data to identify slow requests in a specific user visit, and then drill down from the individual visit into your entire server-side infrastructure (Java, .NET, PHP) down to a single method invocation or database call. For any user visit, see call count, bind values, round trip and execution times on any individual transaction. See User Experience Management for more information. Business transactions let you organize and identify specific types of user requests such as logging in or adding items to a cart, and translate the technical data captured by AppMon&apos;s user experience, application, and infrastructure monitoring capabilities into relevant information for your business. This provides real-time visibility of correlated application performance and business performance data, helping all team members better understand applications, infrastructure, and the resulting impact on your business. AppMon provides built-in host and system monitoring across all supported operating systems and machines in your application environment. Every type of Agent, in addition to the standalone Host Monitoring Agent, provides host metrics for CPU, memory, network, and disk. Automatic health indicators are calculated to warn about host-specific problems that may also affect your application or specific business transactions. 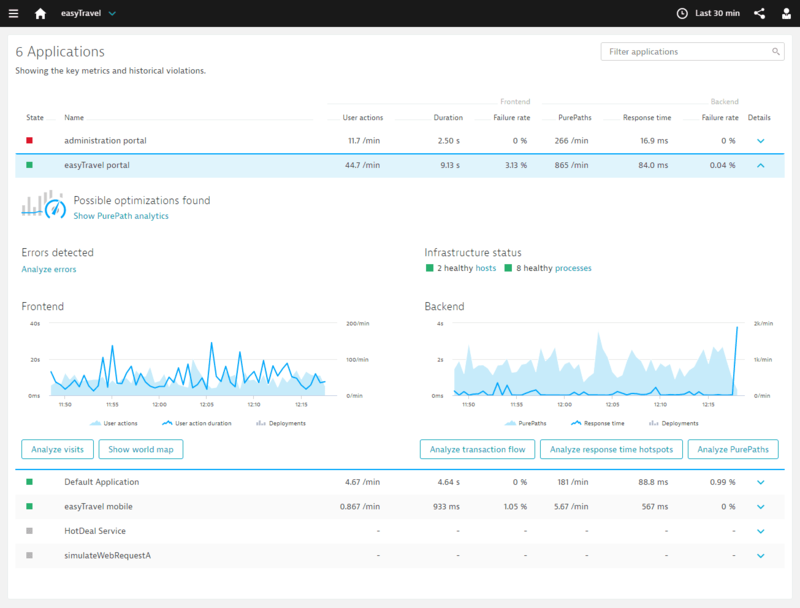 To supplement the built-in Host Monitoring capabilities, AppMon offers Monitors for Windows, Linux, SNMP, Oracle v$ Stats, and others that can periodically pull data from different types of data sources. AppMon Client dashboards are the window through which you view captured application monitoring and diagnostic data. Use preconfigured dashboards to quickly access data such as system health, application problems, and response times experienced by end users. You can also create custom dashboards and specify which data to display in a specific format and which users to share the data with. View dashboards in the AppMon Client, a web browser, or as a generated PDF, XML or Excel report. See Client UI Overview, Dashboards and Reporting for more information. To isolate and share exact problem context, AppMon records diagnostic sessions, which are distributable files that capture the full transactional context contained in one or more PurePaths. Sessions promote efficient collaboration by providing a common language for problem resolution that can be shared across development, test, and operations teams. 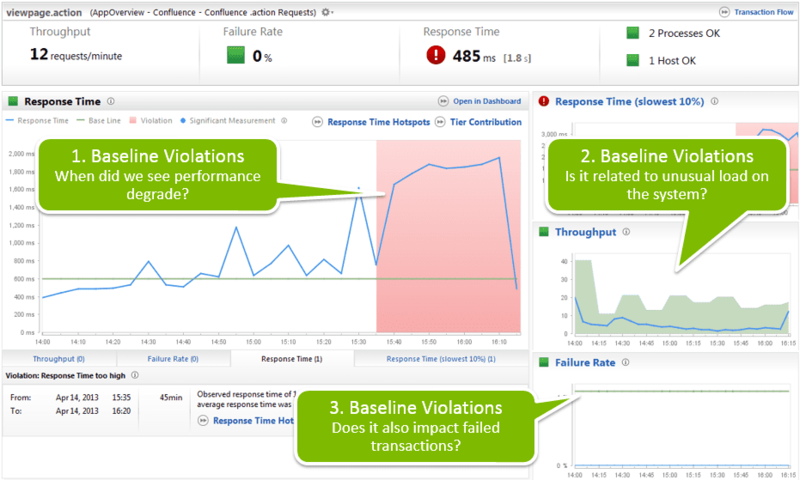 To avoid reporting false positives and generating unnecessary alerts that can occur with traditional statistical approaches that look only at averages and violations based on standard deviation, AppMon&apos;s smart baseline technology uses the statistical characteristics of different application metrics and employs advanced statistical models to identify only relevant application performance anomalies. 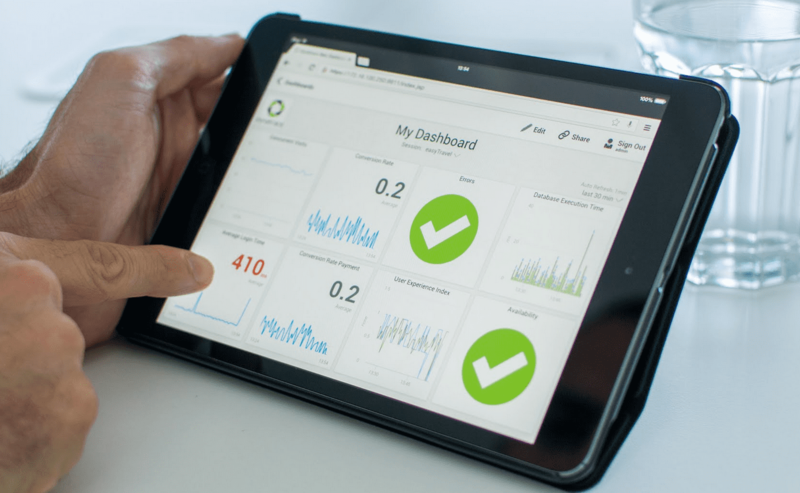 Smart baselining combined with AppMon&apos;s complex alert notification capability help you detect and troubleshoot problems before users are impacted. See Incidents and Alerting for more information. 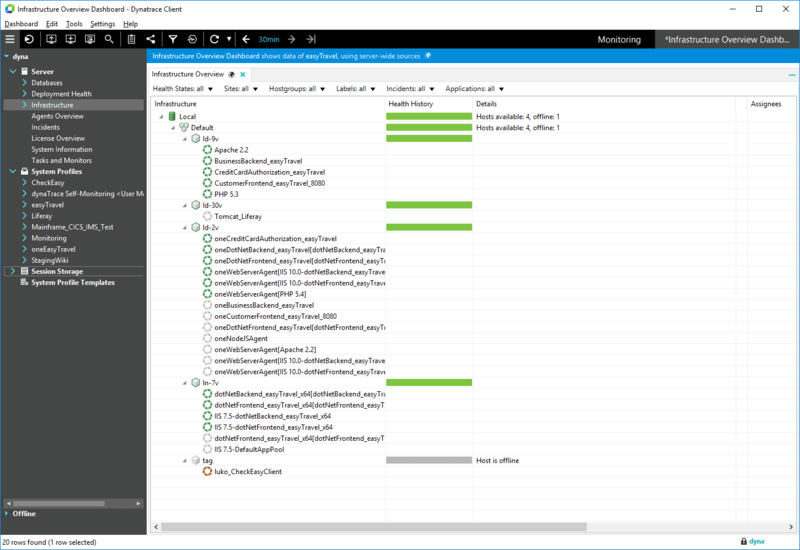 AppMon includes integration points for other systems in your organization, such as development IDEs (Eclipse & Visual Studio), load testing (SilkPerformer & LoadRunner), and other monitoring tools (DC RUM and Synthetic Monitoring). In addition, you can extend AppMon capabilities by installing plugins that provide new features and functions for system monitoring, application monitoring, custom actions, and lifecycle automation. Use the REST interface to automate commonly performed tasks, such as starting and stopping session recording, and triggering memory dumps. Promoting performance data sharing across development, test, and operations. Providing reliable metrics along your delivery pipeline through automation interfaces for CI/CD systems, such as Jenkins, Bamboo, and TeamCity. Delivering more stable applications in production faster through automatic analysis of regressions and the comparison of response times, structural differences, code executions, errors, exceptions and database performance. 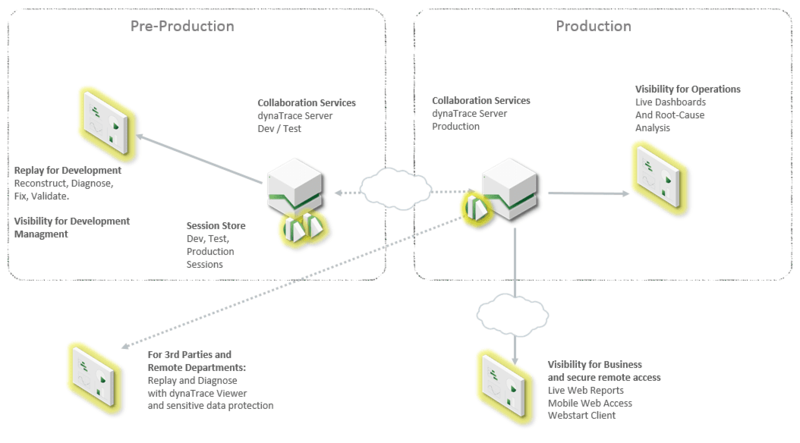 See Continuous Delivery & Test Automation for more information. AppMon provides extensive end-user, application and infrastructure platform and technology support that includes mobile apps, web apps, web browsers, web servers, Java, .NET, Node.js, PHP, databases, middleware and mainframe apps. See System Requirements and Supported Technologies for a comprehensive listing.